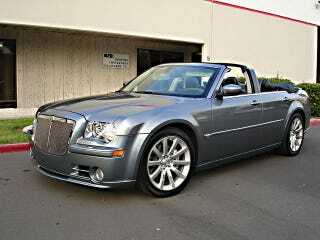 Four door convertibles are the height of ostentation. Just think how elegant JFK looked in his presidential Lincoln — I mean, up to a point. Today's Nice Price or Crack Pipe custom Chrysler 300 lets the sun shine in, but is its price something that you would rather shine on? You know what, people will stick damn-near anything up their butts. I have a friend who is an ER doc, and the things she tells me she's pulled out of people's fudge factories would make your hair stand on end. A similarly odd insertion took place in yesterday's Audi-powered Boxster. It wasn't the 4.2-litre V8, which was actually all kinds of cool No, it was the weird second shifter which made about as much sense as a third cheek. That and cataractic headlamps meant it was additionally stuffed full of an 82% Crack Pipe loss. The Audi 4.2 is a pretty complex compilation of spinny bits and multiple everything that conspires to produce copious amounts of horsepower. Contrastingly Chrysler's Hemi takes a decidedly different approach, preferring size and its eponymous combustion chamber shape over a profusion of cams, valves and repair bills. Today's 300C SRT8 is powered by the famed Hemi V8, here in 6.1-litre, 425-bhp form, and while that engine is famous for the shape of the ceiling of its combustion chambers, this 300 is notable for the fact that its ceiling is removable. Convertible 300s aren't all that uncommon, however the thought of losing that major structural component, and then unleashing the 420 lb-ft torque monster under the hood makes you wonder how long they'll be able to keep all four tires on the ground at the same time. This conversion at least has retained its B-pillar as a basket handle reminiscent of the Rabbit ragtop or Chrysler's own PT Cruiser. That also allows for the retention of the stock seatbelt mounts and a dome light! The rest of the car is pretty stock with SRT alloys and a subtle duck tail spoiler. Up front there is a custom grille, however. Who turned this Mopar into Marie Antoinette? It's hard to say as there's a cottage industry in these conversions on both coasts. The seller seems to know as the ad states the top is in need of replacement. That's an additional two grand to drop on top of the car's $15,500 purchase price. Of course that buys you everything that came with the top of the line SRT8 back in 2006, with the possible exception of torsional rigidity. That means leather on pretty much everything you touch, including a pair of SRT8 buckets that are a lot better to look at than they are to sit in. There's also power everything and a dash-mounted NAV unit that hopefully won't be rendered unreadable due to uncontrollable cowl shake. So far, according to the ad, it has 74K under its tires, so potentially it's not going to snap in two. In addition to the issues with the top, you'd have to check out how well the windows seal against its frame as the car has gone from framed windows to frameless, which may mean car washes will be an adventure. 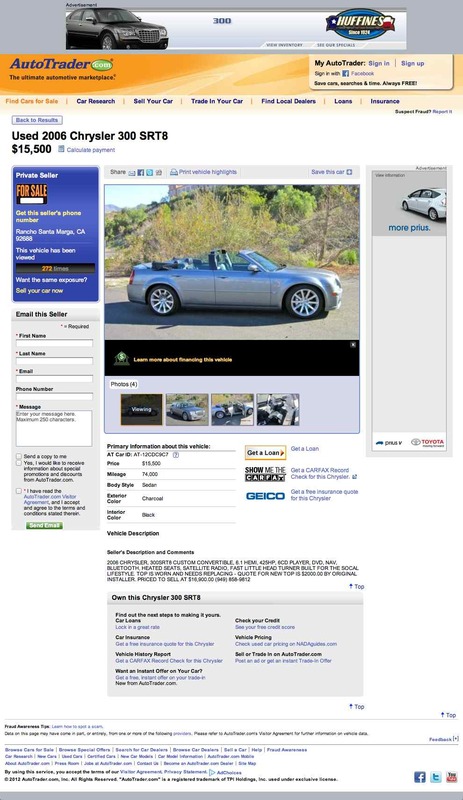 The question is, would spending $15,500 for this custom drop top sedan be an adventure in frustration? What do you think, is that price - plus the cost of having it fitted with new canvas - something that makes this an SRT-great? Or, is the price more ragged-edged than the top? H/T to snapoversteer for the hookup!